For other uses, see Base (disambiguation). Soaps are weak bases formed by the reaction of fatty acids with sodium hydroxide or potassium hydroxide. In chemistry, bases are substances that, in aqueous solution, release hydroxide (OH−) ions, are slippery to the touch, can taste bitter if an alkali, change the color of indicators (e.g., turn red litmus paper blue), react with acids to form salts, promote certain chemical reactions (base catalysis), accept protons from any proton donor or contain completely or partially displaceable OH− ions. Examples of bases are the hydroxides of the alkali metals and the alkaline earth metals (NaOH, Ca(OH)2, etc.—see alkali hydroxide and alkaline earth hydroxide). These particular substances produce hydroxide ions (OH−) in aqueous solutions, and are thus classified as Arrhenius bases. For a substance to be classified as an Arrhenius base, it must produce hydroxide ions in an aqueous solution. Arrhenius believed that in order to do so, the base must contain hydroxide in the formula. This makes the Arrhenius model limited, as it cannot explain the basic properties of aqueous solutions of ammonia (NH3) or its organic derivatives (amines). There are also bases that do not contain a hydroxide ion but nevertheless react with water, resulting in an increase in the concentration of the hydroxide ion. An example of this is the reaction between ammonia and water to produce ammonium and hydroxide. In this reaction ammonia is the base because it accepts a proton from the water molecule. Ammonia and other bases similar to it usually have the ability to form a bond with a proton due to the unshared pair of electrons that they possess. In the more general Brønsted–Lowry acid–base theory, a base is a substance that can accept hydrogen cations (H+)—otherwise known as protons. In the Lewis model, a base is an electron pair donor. In water, by altering the autoionization equilibrium, bases yield solutions in which the hydrogen ion activity is lower than it is in pure water, i.e., the water has a pH higher than 7.0 at standard conditions. A soluble base is called an alkali if it contains and releases OH− ions quantitatively. However, it is important to realize that basicity is not the same as alkalinity. Metal oxides, hydroxides, and especially alkoxides are basic, and conjugate bases of weak acids are weak bases. Bases can be thought of as the chemical opposite of acids. However, some strong acids are able to act as bases. Bases and acids are seen as opposites because the effect of an acid is to increase the hydronium (H3O+) concentration in water, whereas bases reduce this concentration. A reaction between an acid and a base is called neutralization. In a neutralization reaction, an aqueous solution of a base reacts with an aqueous solution of an acid to produce a solution of water and salt in which the salt separates into its component ions. If the aqueous solution is saturated with a given salt solute, any additional such salt precipitates out of the solution. The notion of a base as a concept in chemistry was first introduced by the French chemist Guillaume François Rouelle in 1754. He noted that acids, which at that time were mostly volatile liquids (like acetic acid), turned into solid salts only when combined with specific substances. Rouelle considered that such a substance serves as a "base" for the salt, giving the salt a "concrete or solid form". Concentrated or strong bases are caustic on organic matter and react violently with acidic substances. Aqueous solutions or molten bases dissociate in ions and conduct electricity. Reactions with indicators: bases turn red litmus paper blue, phenolphthalein pink, keep bromothymol blue in its natural colour of blue, and turn methyl orange yellow. The pH of a basic solution at standard conditions is greater than seven. Bases are bitter in taste. In this equation, both the base (B) and the extremely strong base (the conjugate base) compete with one another for the proton. As a result, bases that react with water have relatively small equilibrium constant values. The base is weaker when it has a lower equilibrium constant value. 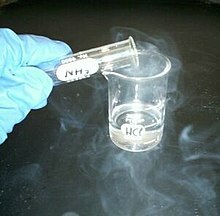 Ammonia fumes from aqueous ammonium hydroxide (in test tube) reacting with hydrochloric acid (in beaker) to produce ammonium chloride (white smoke). If equal quantities of NaOH and HCl are dissolved, the base and the acid neutralize exactly, leaving only NaCl, effectively table salt, in solution. Weak bases, such as baking soda or egg white, should be used to neutralize any acid spills. Neutralizing acid spills with strong bases, such as sodium hydroxide or potassium hydroxide, can cause a violent exothermic reaction, and the base itself can cause just as much damage as the original acid spill. A base is also defined as a molecule that has the ability to accept an electron pair bond by entering another atom's valence shell through its possession of one electron pair. There are a limited number of elements that have atoms with the ability to provide a molecule with basic properties. Carbon can act as a base as well as nitrogen and oxygen. Fluorine and sometimes rare gases possess this ability as well. This occurs typically in compounds such as butyl lithium, alkoxides, and metal amides such as sodium amide. Bases of carbon, nitrogen and oxygen without resonance stabilization are usually very strong, or superbases, which cannot exist in a water solution due to the acidity of water. Resonance stabilization, however, enables weaker bases such as carboxylates; for example, sodium acetate is a weak base. The cations of these strong bases appear in the first and second groups of the periodic table (alkali and earth alkali metals). Acids with a pKa of more than about 13 are considered very weak, and their conjugate bases are strong bases. Group 1 salts of carbanions, amides, and hydrides tend to be even stronger bases due to the extreme weakness of their conjugate acids, which are stable hydrocarbons, amines, and dihydrogen. Usually these bases are created by adding pure alkali metals such as sodium into the conjugate acid. They are called superbases, and it is impossible to keep them in water solution because they are stronger bases than the hydroxide ion. As such, they deprotonate the conjugate acid water. For example, the ethoxide ion (conjugate base of ethanol) in the presence of water undergoes this reaction. When a neutral base forms a bond with a neutral acid, a condition of electric stress occurs. The acid and the base share the electron pair that formerly only belonged to the base. As a result, a high dipole moment is created, which can only be destroyed by rearranging the molecules. A weak base is one which does not fully ionize in an aqueous solution, or in which protonation is incomplete. Depending on a solid surface's ability to successfully form a conjugate base by absorbing an electrically neutral acid, the basic strength of the surface is determined. "The number of basic sites per unit surface area of the solid" is used to express how much base is found on a solid base catalyst. Scientists have developed two methods to measure the amount of basic sites: titration with benzoic acid using indicators and gaseous acid adsorption. A solid with enough basic strength will absorb an electrically neutral acid indicator and cause the acid indicator's color to change to the color of its conjugate base. When performing the gaseous acid adsorption method, nitric oxide is used. The basic sites are then determined using the amount of carbon dioxide than is absorbed. Basic substances can be used as insoluble heterogeneous catalysts for chemical reactions. Some examples are metal oxides such as magnesium oxide, calcium oxide, and barium oxide as well as potassium fluoride on alumina and some zeolites. Many transition metals make good catalysts, many of which form basic substances. Basic catalysts have been used for hydrogenations, the migration of double bonds, in the Meerwein-Ponndorf-Verley reduction, the Michael reaction, and many other reactions. Both CaO and BaO can be highly active catalysts if they are treated with high temperature heat. 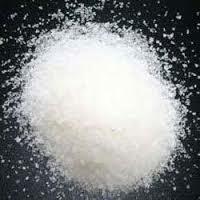 Sodium hydroxide is used in manufacture of soap, paper and the synthetic fiber rayon. 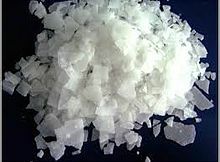 Calcium hydroxide (slaked lime) is used in the manufacture of bleaching powder. Calcium hydroxide is also used to clean the sulfur dioxide, which is caused by exhaust, that is found in power plants and factories. Magnesium hydroxide is used as an 'antacid' to neutralize excess acid in the stomach and cure indigestion. Sodium carbonate is used as washing soda and for softening hard water. Sodium hydrogen carbonate is used as baking soda in cooking food, for making baking powders, as an antacid to cure indigestion and in soda acid fire extinguisher. The number of ionizable hydroxide (OH-) ions present in one molecule of base is called the acidity of bases. On the basis of acidity bases can be classified into three types: monoacidic, diacidic and triacidic. Barium hydroxide, magnesium hydroxide, calcium hydroxide, zinc hydroxide, iron(II) hydroxide, tin(II) hydroxide, lead(II) hydroxide, copper(II) hydroxide, etc. The term "base" appears to have been first used in 1717 by the French chemist, Louis Lémery, as a synonym for the older Paracelsian term "matrix." In keeping with 16th-century animism, Paracelsus had postulated that naturally occurring salts grew within the earth as a result of a universal acid or seminal principle having impregnated an earthy matrix or womb. ... Its modern meaning and general introduction into the chemical vocabulary, however, is usually attributed to the French chemist, Guillaume-François Rouelle. ... Rouelle explicitly defined a neutral salt as the product formed by the union of an acid with any substance, be it a water-soluble alkali, a volatile alkali, an absorbent earth, a metal, or an oil, capable of serving as "a base" for the salt "by giving it a concrete or solid form." Most acids known in the 18th century were volatile liquids or "spirits" capable of distillation, whereas salts, by their very nature, were crystalline solids. Hence it was the substance that neutralized the acid which supposedly destroyed the volatility or spirit of the acid and which imparted the property of solidity (i.e., gave a concrete base) to the resulting salt. —  William Jensen, The origin of the term "base"
Look up base in Wiktionary, the free dictionary. ^ Johll, Matthew E. (2009). Investigating chemistry: a forensic science perspective (2nd ed.). New York: W. H. Freeman and Co. ISBN 1429209895. OCLC 392223218. ^ Whitten et al. (2009), p. 363. ^ a b c d e f g Zumdahl & DeCoste (2013), p. 257. ^ Whitten et al. (2009), p. 349. ^ a b c d e f g h i j Lewis, Gilbert N. (1938). "Acids and Bases" (PDF). Journal of the Franklin Institute. pp. 293–313. Retrieved 19 February 2015. ^ a b Jensen, William B. (2006). "The origin of the term 'base'" (PDF). The Journal of Chemical Education. 83 (8): 1130. Bibcode:2006JChEd..83.1130J. doi:10.1021/ed083p1130. Archived from the original (PDF) on 4 March 2016. ^ "Definition of BASE". www.merriam-webster.com. Archived from the original on 21 March 2018. Retrieved 3 May 2018. ^ a b Zumdahl & DeCoste (2013), p. 258. ^ Zumdahl & DeCoste (2013), p. 255. ^ a b c d Zumdahl & DeCoste (2013), p. 256. ^ a b c d e Tanabe, Kozo (1970). Solid Acids and Bases: their catalytic properties. Academic Press. p. 2. Retrieved 19 February 2015. ^ a b c d e f g Tanabe, K.; Misono, M.; Ono, Y.; Hattori, H. (1990). New Solid Acids and Bases: their catalytic properties. Elsevier. p. 14. Retrieved 19 February 2015. ^ "Electrophile - Nucleophile - Basicity - Acidity - pH Scale". City Collegiate. Archived from the original on 30 June 2010. Retrieved 20 June 2016. ^ "What is TRIACIDIC? definition of TRIACIDIC (Science Dictionary)". Science Dictionary. 2013-09-14. Retrieved 2019-03-14. ^ "Introduction to Bases: Classification, Examples with Questions & Videos". Toppr-guides. 2018-02-02. Retrieved 2019-03-14. Whitten, Kenneth W.; Peck, Larry; Davis, Raymond E.; Lockwood, Lisa; Stanley, George G. (2009). Chemistry (9th ed.). ISBN 0-495-39163-8. Zumdahl, Steven; DeCoste, Donald (2013). Chemical Principles (7th ed.). Mary Finch. This page was last edited on 18 April 2019, at 04:01 (UTC).